The Stock Trading in Private Companies article covered Facebook's market valuation as of year end 2010. It also covered Goldman Sachs offering Facebook investments opportunities to its wealthy private clients. 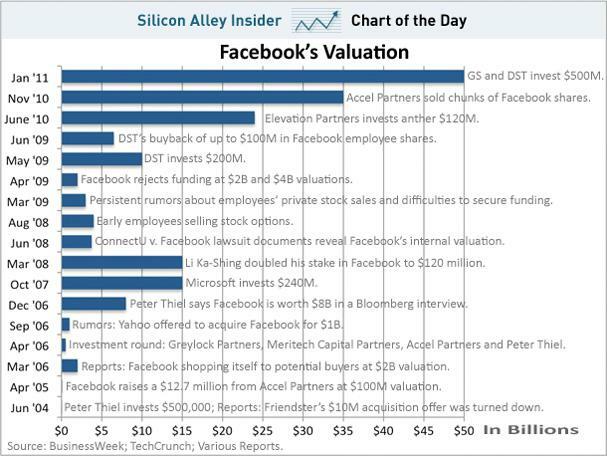 Here is a look at Facebook's valuation history over the last 6 years (Facebook was launched in February/2004). With the latest $500 million investment by Goldman Sachs and DST on a Goldman Sachs valuation of $50 billion, Facebook is on solid grounds as a well funded and valuated company.